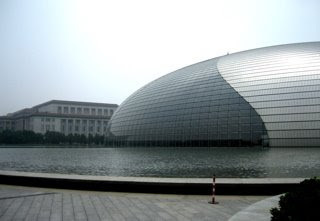 The National Theater in Beijing, next to the Great Hall of the People, and very close to Tian'anmen Square - the historic center of Beijing. It's an intimidating building, and would be easy to get lost in. Of course that wasn't allowed to happen. 2019 seats - really a gorgeous warm acoustic. 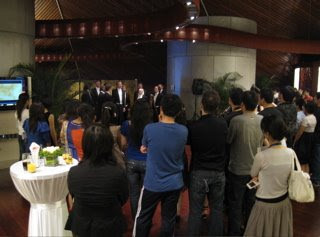 After they got there in various stages , settled in, and coughed* a fair amount, the audience was pretty attentive - including of course the conversations, which we presume were about the performance. An interesting thing is that if you raise your camera it will be lasered by red pointers operated by the personnel distributed around the hall. A cheap and effective solution which worked very well... hence no pictures of our performance. 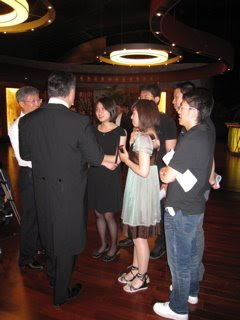 This was our joint performance with The Shanghai Quartet. 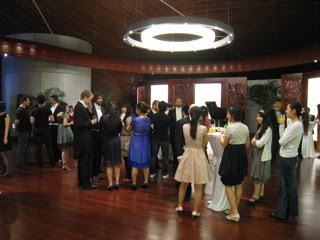 The audience appreciated Chen Yi's piece, but really came to life for the Chinese folk song set. 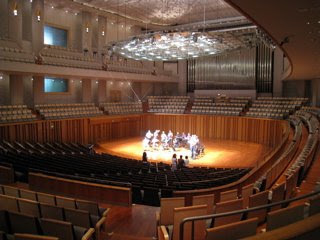 The people who started clapping in time were hushed by the others, and there was a certain amount of singing along and it was all very active and brought the concert to a nice conclusion. *Beijing is a dry place. There's lots of coughing. 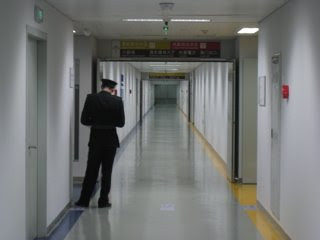 We are trying not to participate as we are told that at the checkpoint between Shenzen and Hong Kong on Saturday, there will be heightened health surveillance. 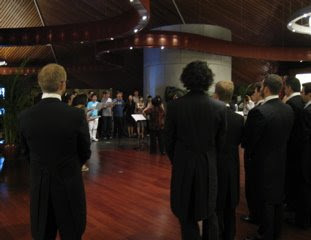 After the concert there was a gala reception at which the Youth Chamber Choir of the Chinese National Center for the Performing Arts, directed by Lingfen Wu, sang three Chinese songs for us - two in arrangements by Chen Yi. We responded with "Journey to Recife" and "Way up in Jerusalem." Then friendly exchange breaks out. Professor Wu meets Gabe. 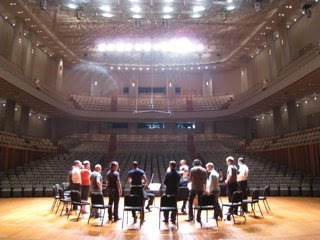 She explained that choral music is indeed relatively new to China. Before l990, she said, mostly revolutionary songs were sung in groups. 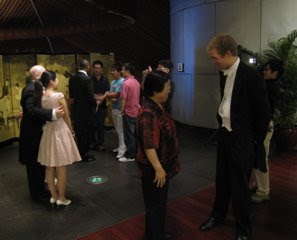 Then when Chinese musicians began to come back from abroad ( as she did from the Moscow Conservatory) they began introducing choral music.